Take one look at these chess pieces and you’ll notice that they are not your typical roundup of pawns, knights, and rooks. These exquisitely hand-painted figures have distinct personalities and the subsets on either side are the board have decidedly opposite characterizations. Among the red pieces, representing the Communists, the harvester pawns assume prepared positions. Behind them, their farm maiden queen swoons as an emblem of the virtues of agrarian reform and a symbol of the happiness that was said to follow from collective farming. The group’s leader, a humble blacksmith rather than a traditional king, stands with confidence and nonchalance before the impending battle. Across the board, the opponent white pieces, or Tsarist Russians, are startlingly different. The group of white pieces includes pawns wrapped in chains, a sinfully decadent queen unable to handle the overabundance of gold coins spilling from her cornucopia, and a menacing king wearing a skeletal mask. This chess set is called “The Reds and the Whites” or, alternatively, “The Communists and the Capitalists”. These visual cues make it all too easy for chess players using this set to realize which side is intended to garner their respect and support. The set was produced in Russia in 1922-32 following the 1917 Bolshevik Revolution. This revolution was the pinnacle of building political turmoil in the late days of WWI that resulted in the turnover of the Russian government from imperial to communist leadership. The Bolshevik’s rallying cry for “peace, land, and bread” sought to highlight what the Bolsheviks believed to be the failures of the Tsarist autocracy in providing for the common worker. Bolshevik rebels eschewed bourgeois society and any vestiges of economic elitism; the lynchpin of such socioeconomic evil, they believed, was capitalism. This chess set was designed by Natalya Yakovlevna Danko, who worked for the State Porcelain Factory of Russia (called the Imperial Porcelain Factory prior to the revolution). It is just one of many examples of porcelain propaganda that this company produced in the years following the revolution. Propaganda of all forms was extremely important to the Russian communist program. It espoused communist ideology in an aggressively accessible way; the messages were intentionally simplified, exaggerated, and explicitly clear. Propaganda was also omnipresent, as this seemingly innocuous chess set demonstrates. All forms of culture, from art to cinema to radio, were imbued to their saturation points with ideology; indeed, their only function in the eyes of the State was to communicate these ideas and these ideas alone. Propaganda programming went hand-in-hand with oppressive censorship of dissenting or even simply unapproved messages. Overwriting a game such as chess with propaganda ideology delivers a particularly salient message. 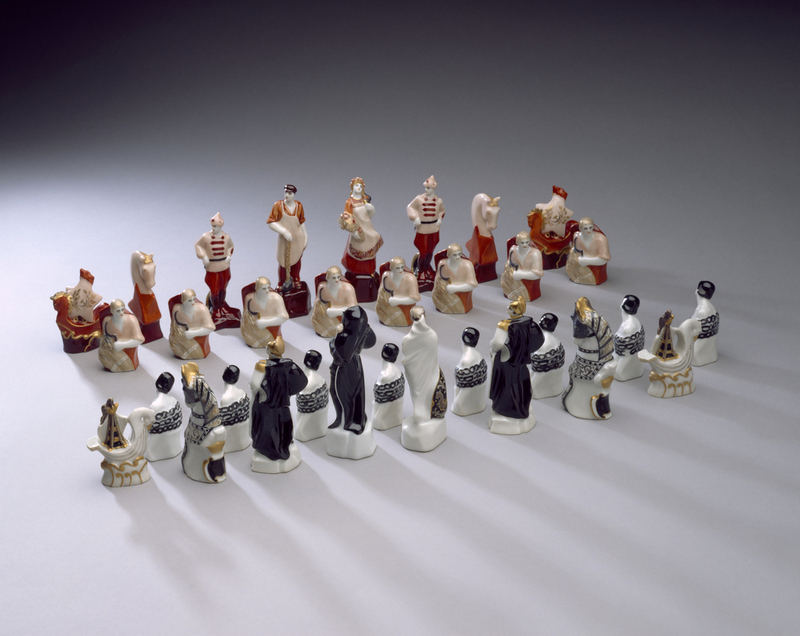 By characterizing the two opposing groups of pieces as communists and capitalists, the makers of this chess set have communicated that the real-life counterparts to these groups exist as diametric opposites, completely at odds with one another. The game implies a struggle or a fight between the two groups and further cements the idea of capitalists as the enemy. If someone purchased this game set, their children might have played with it, which would have furthered the State’s mission to pass their ideology to the younger generation. Perhaps, though, the chess set would have simply been on display in the factory store windows in Moscow, its beauty attracting attention and its details telling a story.